Ryuzu’s fancy new G-Guard makes its appearance as this week’s closer. AUTO: [CB1] When this unit is placed on G, you may pay the cost. If you do, your opponent chooses 1 of their back row rear-guards, and puts it on the bottom of their deck. Today we’re introducing a new 《Gear Chronicle》 G Guardian from “Gears of Fate” (on sale September 30th, 2016)! It has a marvelous ability that causes an opponent’s Rearguard to “No longer exist”! 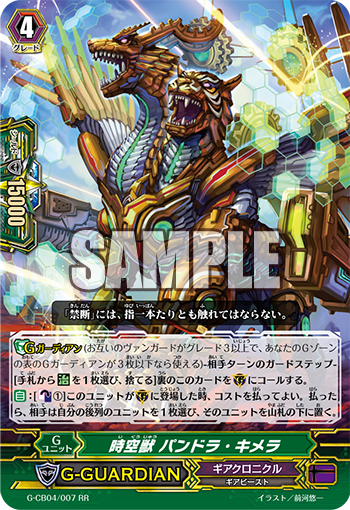 When “Interdimensional Beast, Pandora Chimera” is placed on the field, your opponent is forced to choose a backrow Rearguard to return to the Deck, causing it to vanish from existence. If you use it during the first attack, at least one attack that turn will be weakened. It’s also possible to choose a Rearguard in the middle of Boosting, the Power added by the Boost will be lost. This is something important to keep in mind when using this card. For example, if you combine it with “Vainglory-dream Gear Cat”, it’s possible to increase the Power of your Vanguard that turn by 10000! Also beforehand, if you Call “Steam Maiden, Melem” or “Highbrow Steam, Raphanna” before hand, you’ll be able to shut out your opponent’s attacks. G Guardians have abilities that require proper use depending on the situation. Also 《Cray Elemental》 G Guardians are powerful, so it’s fine when you build your Deck!